Seen everywhere in the stores, Tropical prints are a huge trend this summer! Ohh la la – Aloha! 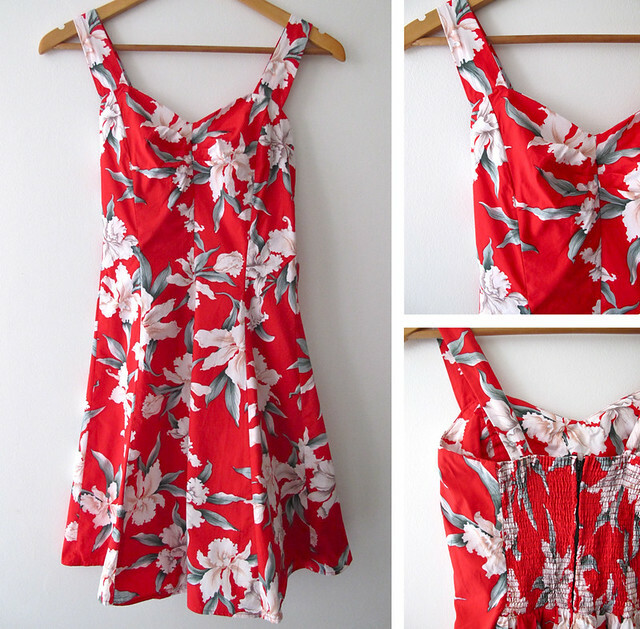 Red hot 1980s tropical print dress! Perfect for summer parties! Don’t like brights? 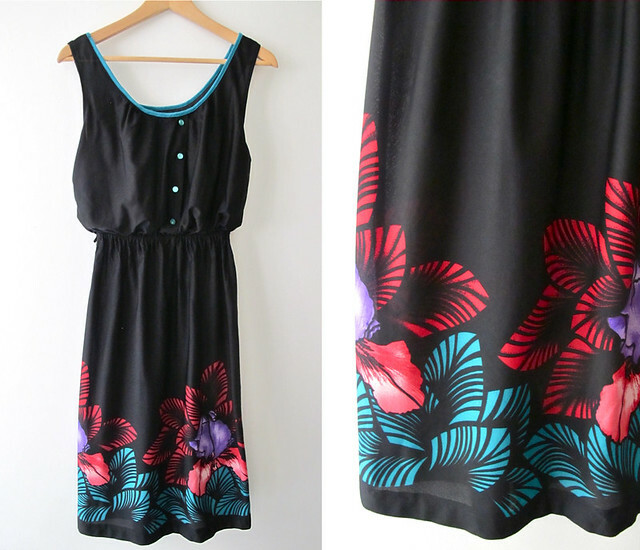 Add a wee touch of colour with this easy, breezy 1980s tropical print dress. 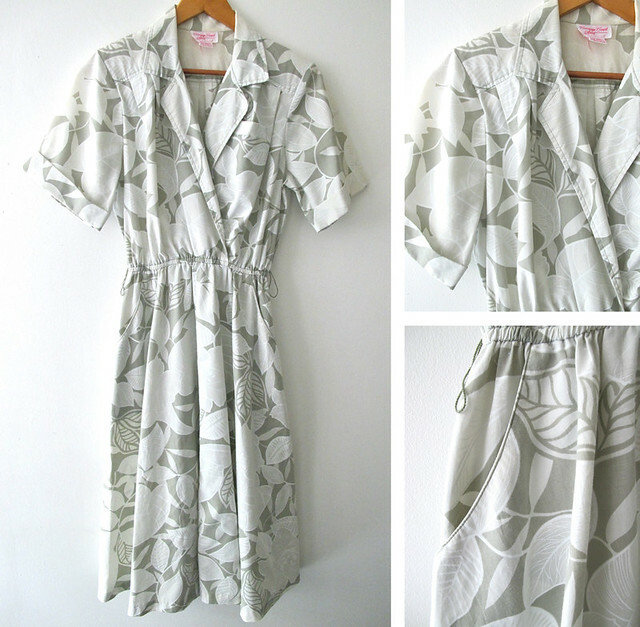 Lovely light mossy green 1980s tropical print shirt dress with hip pockets! Pair it with a waisted belt, slip on your espadrilles and you’re good to go! 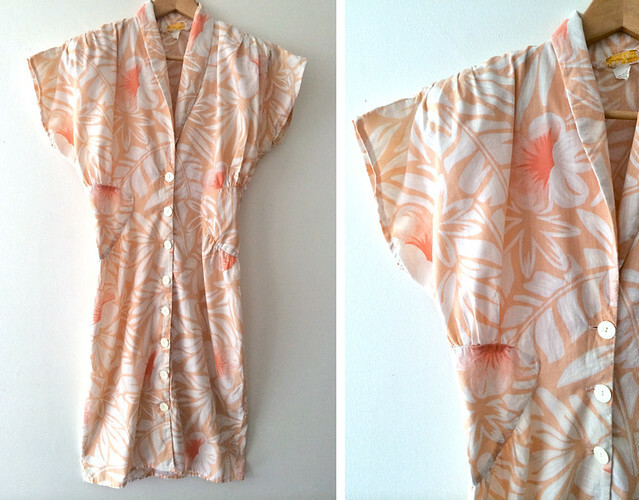 1980s tropical print dress in lovely peachy tones! 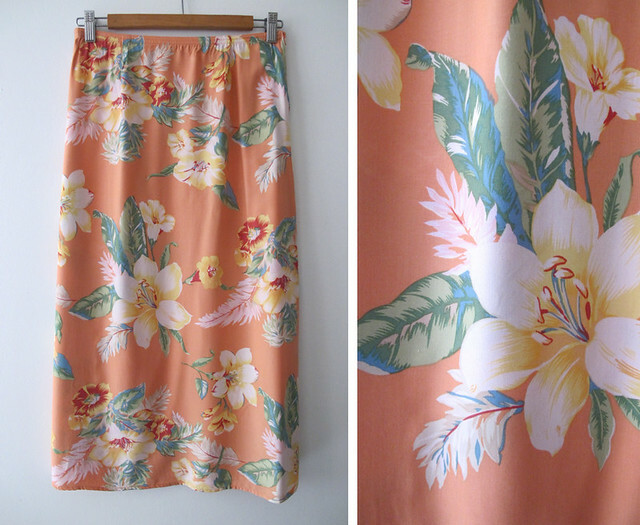 Another yummy peach coloured tropical print – this time in a form of a 1980s skirt . Pump up the volume and try clashing it with a different tropical print top! 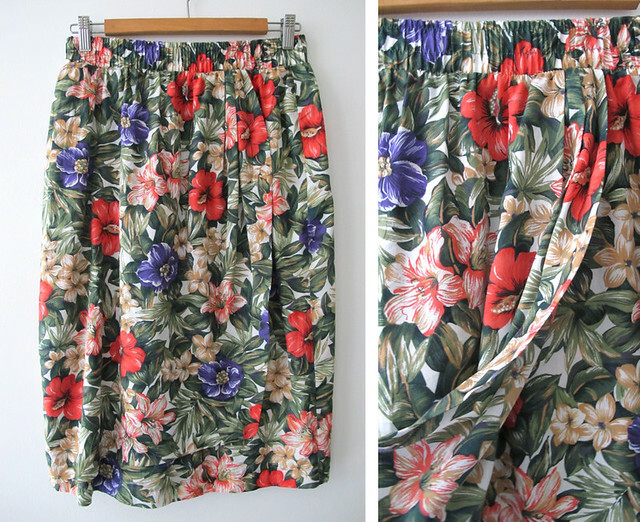 This 1980s tropical print skirt features bursts of bright coloured flowers in among green tropical foliage. 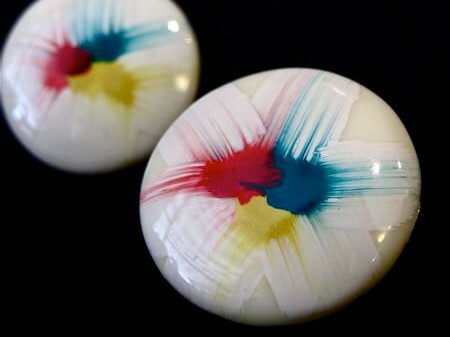 Perfect with a white tee! 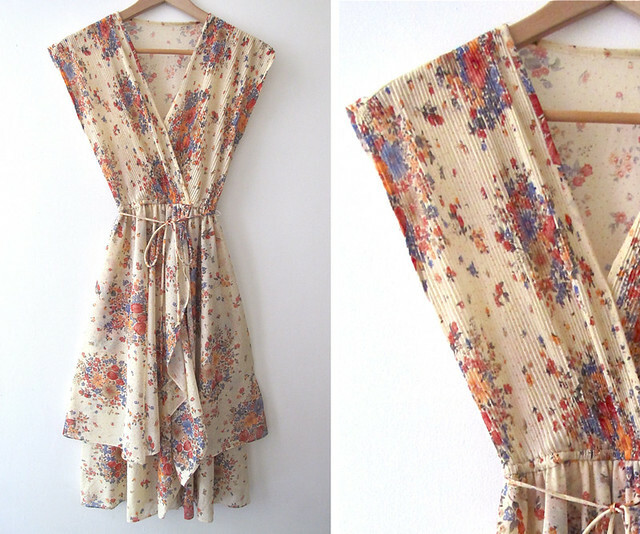 The epitome of femininity and elegance, these timeless 1970s floral dresses are light, floaty, and perfect for summer! Ethereal and romantic 1970s faux-wrap floral print dress, featuring a accordion pleated bodice, and a layered two tiered skirt. 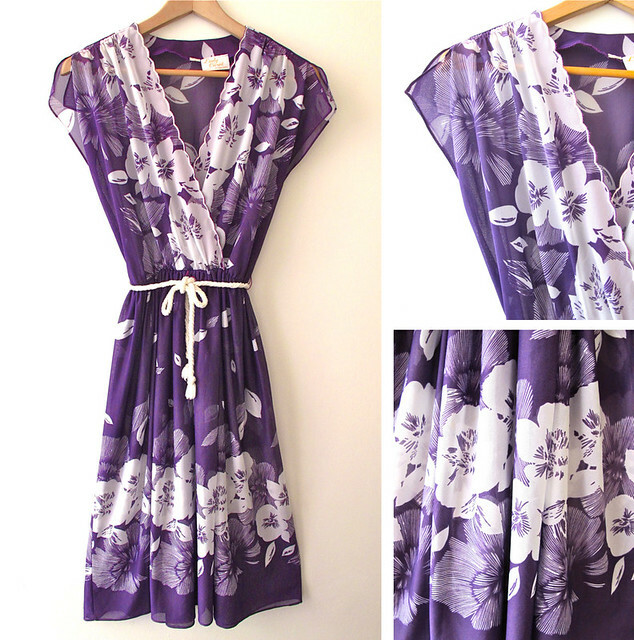 This flattering sheer 1970s dress features a faux wrap bodice, a lovely scalloped neckline, and bold white and purple floral prints. 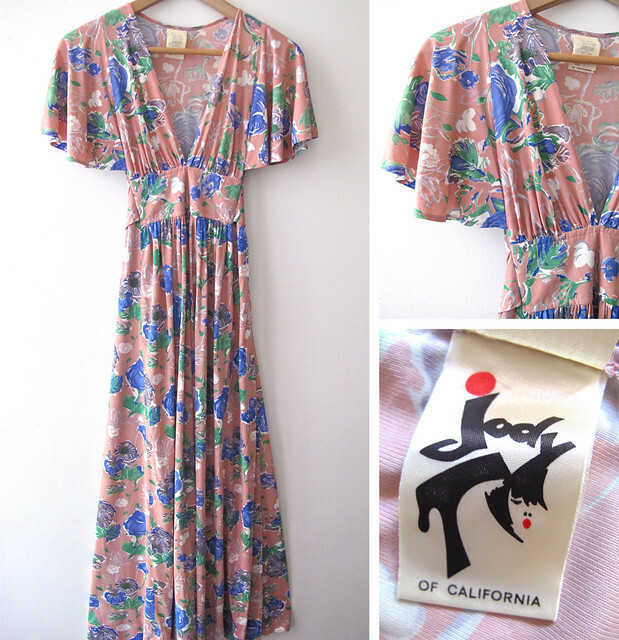 We love the stylized orchid-like floral prints on this pretty 1970s cowl-neck dress! 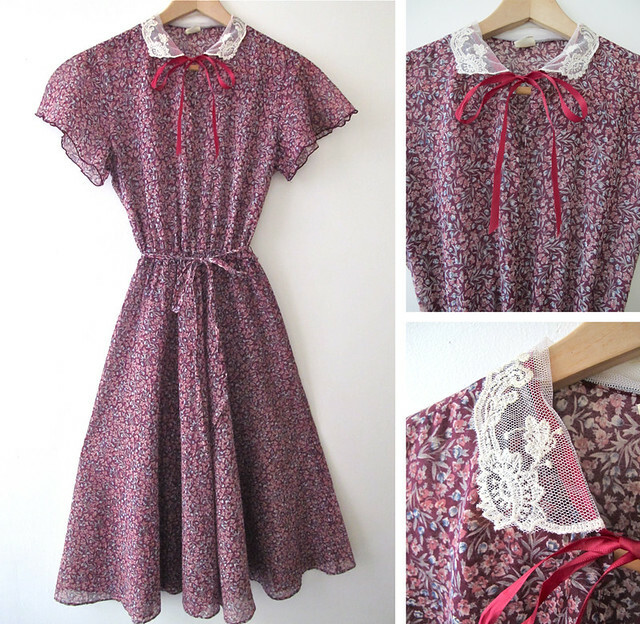 Sweet 1970s floral print dress, complete with a pretty lace collar and a ribbon bow. 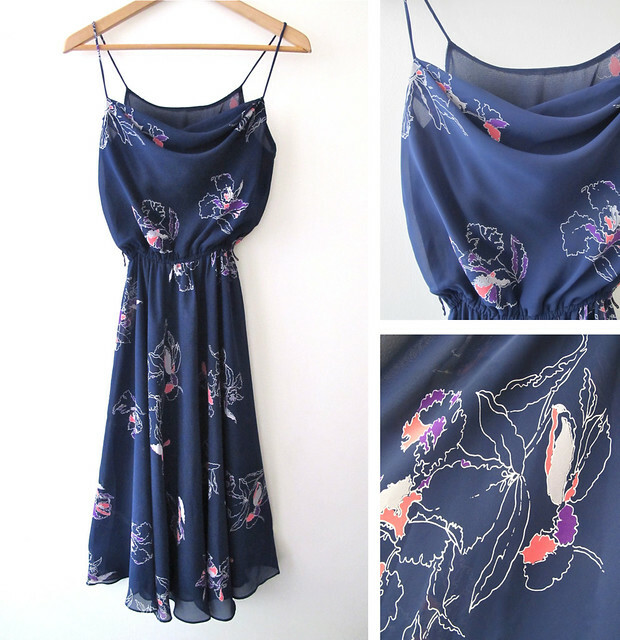 Gorgeous 1970s floral maxi dress – need we say more?! Ah, the JUMPSUIT – Dress it up or dress it down , it’s the one-piece solution to versatile and effortless dressing! Quirky! 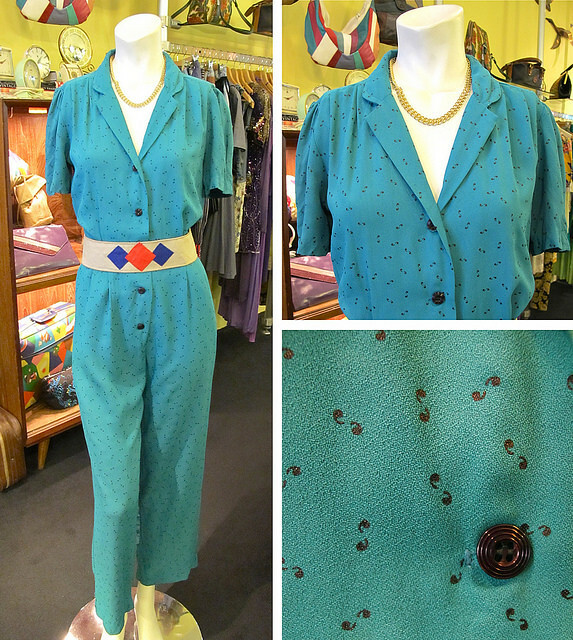 Little comma prints fill this fabulous teal-coloured 1970s jumpsuit! 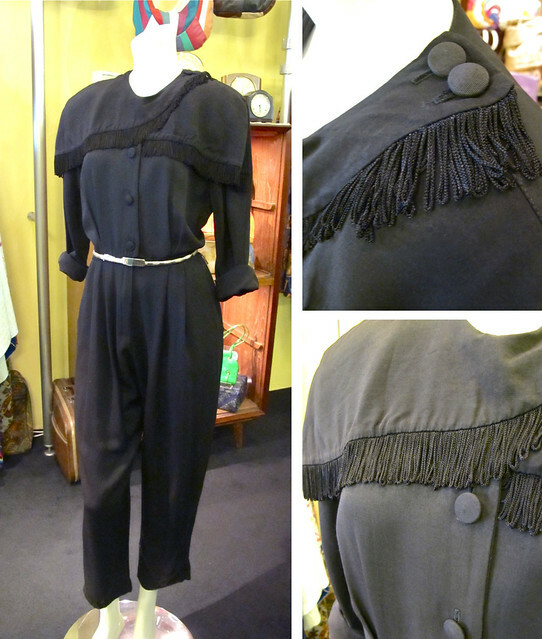 Playful and funky 1980s black jumpsuit featuring looped tassels along the yoke. 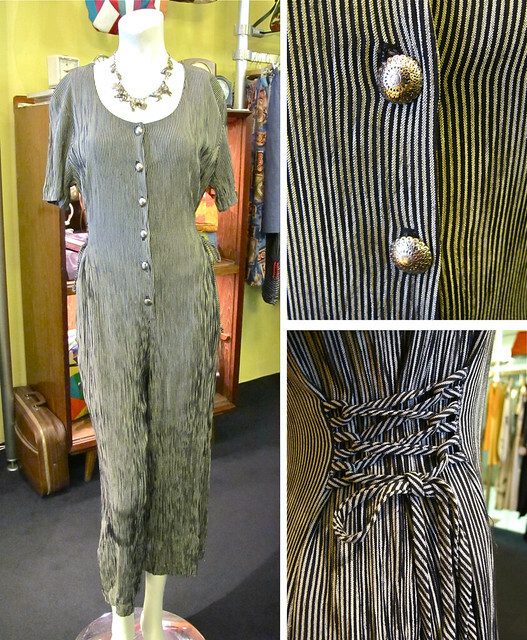 Casual 1980s pin-striped jumpsuit – Pair this with a colourful belt for contrast, step into your canvas sneakers, and you’re good to go! 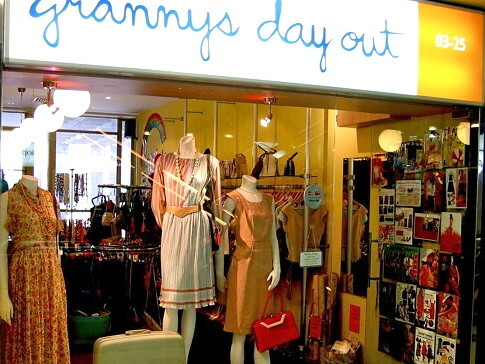 Are You A 60s Gal? CLASSIC & TIMELESS, these pretty 1960s day dresses will ever go out of style! 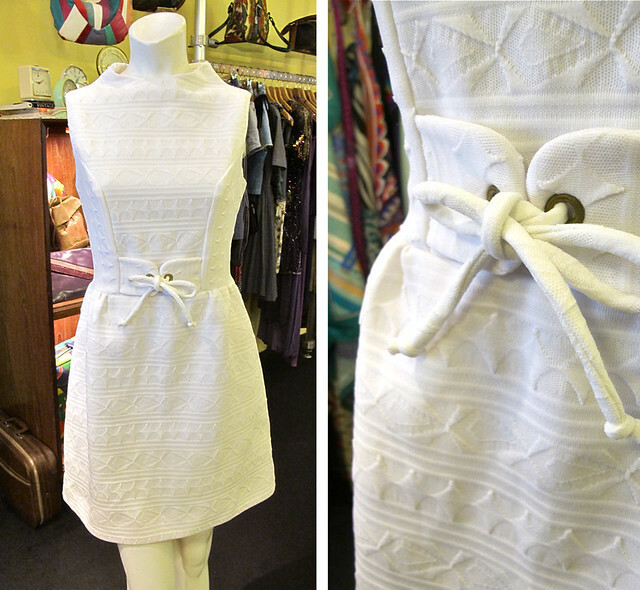 Great little white 1960s dress, with textured rows of different geometric patterns, and a sweet little bow at the waist. We love the blue and green colour combo! 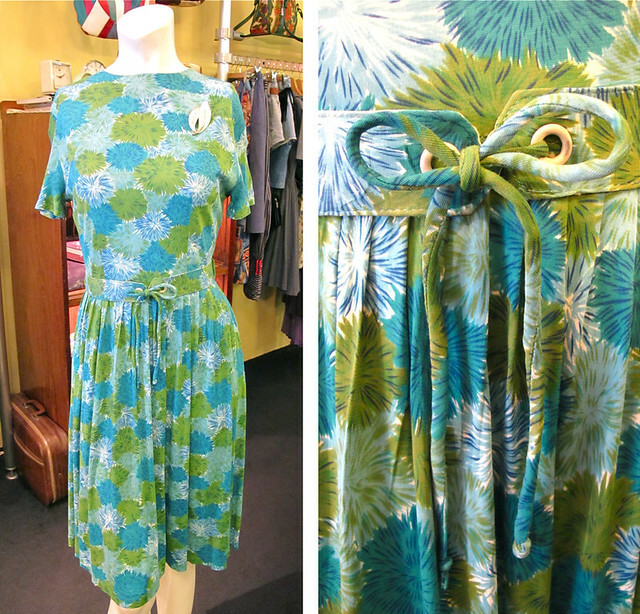 And the floral prints on this 1960s dress look like pom-poms, don’t you think? We’ve featured this one before but thought we should put up a clearer picture of this lovely number! 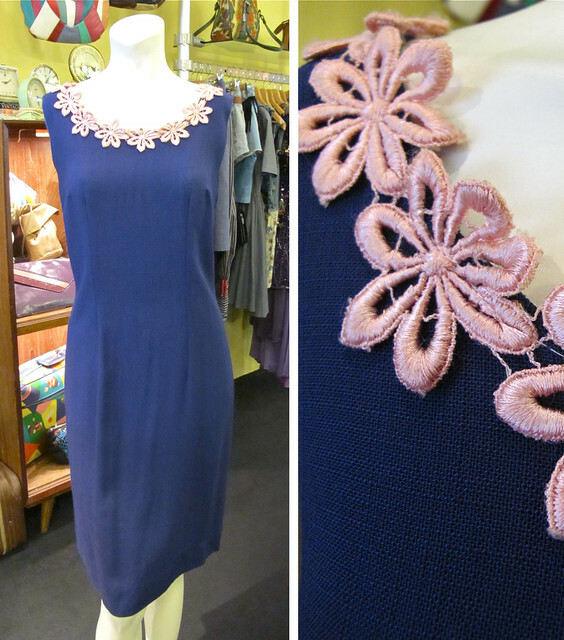 You can’t get more classic than this – A simple and feminine 1960s shift dress in a lovely navy blue , accented with a sweet row of pink embroidered flowers along the neckline. Great for the office, we reckon! 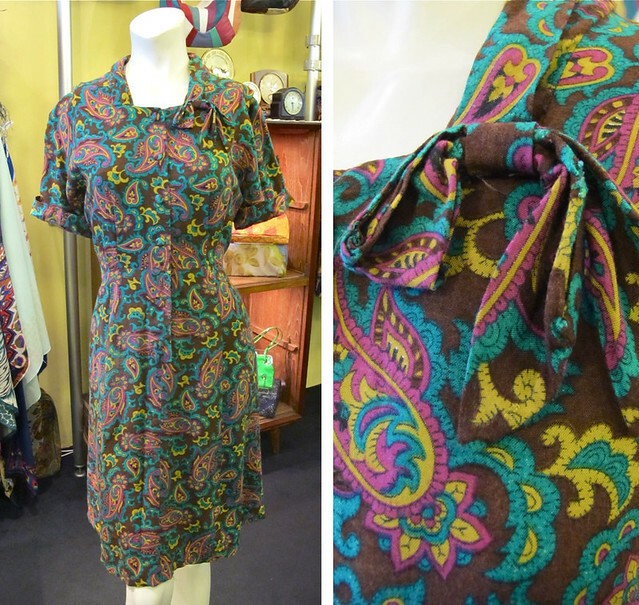 Pretty paisley prints fill this sweet 1960s dress – we love the little bow detail attached at the neckline. 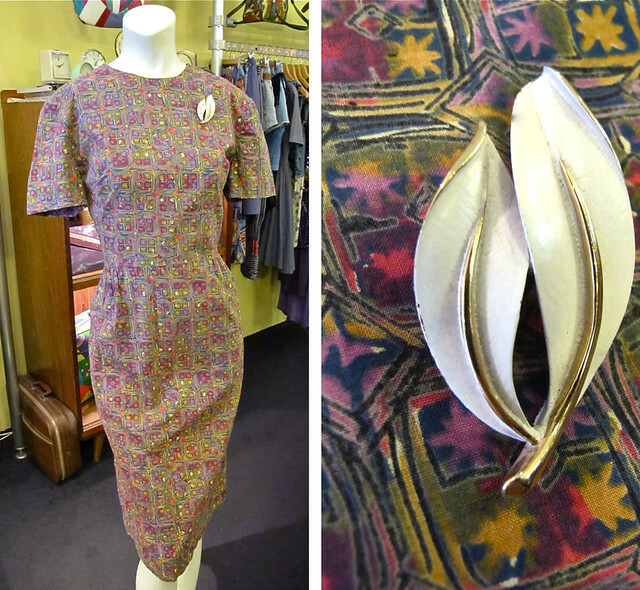 Stars shining brightly through the many “windows” on this quirky printed 1960s sheath dress – To add interest, we’ve styled it with a 1960s Sarah Coventry signed brooch in a stylized leaf shape. Let your hair down and go boho-chic this weekend. Throw on this adorable and cheery loose-fit embroidered top over your favourite pair of shorts, and pair it with sneakers or sandals for a fun and casual look. It could also easily go with a pair of jeans, or perhaps tucked into a flowy maxi skirt. Hippie 1970s maxi dress in a brilliant shade of fuchsia. Great for picnics or the beach, and you’ll definitely be music festival ready with this one. 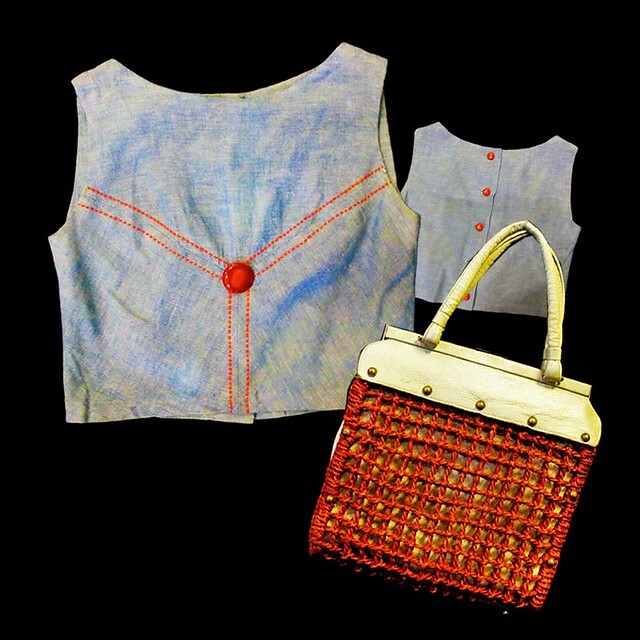 Super adorable 1960s cropped top with red stitching and a cute button on the front, and matching smaller buttons down the back. Complete the look with a long and swishy skirt!